The hero from Infamous, Cole MacGrath, heads to the Southern city of New Marais, which is closely modeled on New Orleans. Although Infamous was a critical success, Brian Fleming of Sucker Punch is not content to mail it in for the sequel. His team is pushing the graphics power of the PS3 to its limits as well as providing an even better open world superhero game than they did with Infamous. Cole MacGrath is back and his electrical powers start off in full force, but he has left Empire City to go south. An entity called the Beast was hinted at at the end of the first game, a civilization destroying monster, and Cole is defeated by it to start out the action in Infamous 2. New Marais is the new sandbox, and it is alive with hatred for Cole MacGrath. The demo starts with a rally led by a man named Bertrand, who does a wonderful Gary Oldman from Fifth Element impression. He whips the crowd into a frenzy by claiming that his militia is the only thing protecting the people from the freaks like Cole. Suddenly, a mutant attacks and Cole, who's been attending his own hate-rally with his friend Zeke, jumps to retaliate. 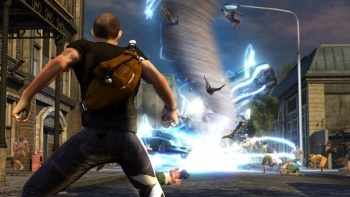 The demo showed off the new combat mechanics of Infamous 2. Cole slides under enemies to hit them from behind, and the animations look context sensitive enough to provide convincing action. Fleming said that the team at Sucker Punch took a cue from modern superhero movies and made the sequel much more physical and visceral. They wanted to get away from the ranged lightning combat that was the focus of Infamous. Cole's power is still electrical, but he now wields an electrified mace called the Amp, which can shock and beat enemies into a supercharged pulp. The agility and maneuverability of Cole is shown off as he chases after Bertrand's limo. The "electrical parkour" looks fun, with Cole jumping onto power lines and sliding down them like they're ski slopes. People run out of Cole's way as he shoots lightning at the buildings of New Marey's French Quarter, tearing down the intricate facades. Fleming said that much of the city will be destructible, with whole neighborhoods reflecting decisions made in game. One good thing about a sequel is that the origin story has already been told and the new game can begin with Cole's powers already unlocked. Sucker Punch looked to superhero movies for inspiration. "The really big thing about this game was deciding that it was a second game," Fleming said after the presentation. "You might think of Batman Begins as the first movie andThe Dark Knight as the second movie, where the character is fully formed and it's not about how he became Batman, it is about Batman. In that sense, [Infamous 2] is about Cole MacGrath. He is a fully-formed superhero from the beginning and he goes on a big journey in this [game]." Development of Infamous 2 is about halfway complete, with over a year left before release on the PS3. Because this game is platform exclusive, Sony is betting that it will sell a lot of consoles. Based on what I saw at the presentation - the fun melee combat, the electrical parkour, and the destructibility of the New Marais setting - Infamous 2 might just make me go out and buy a PS3.